lldreamspell: Vampires Are Watching You! Ready for some action packed Vampire reading? 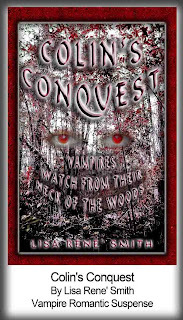 Get Colin's Conquest by Lisa Rene' Smith! Colin, the handsome centenarian vampire knew from the moment he first laid eyes on the lithe young beauty he’d found the perfect mate. The time had come to claim his chosen one...but he didn’t anticipate her feisty nature, and the dangers he’d face in his pursuit. Stubborn and strong, Joanna refused to be taken against her will, yet once bitten, Colin’s hypnotic power permeated her being, causing a love/hate bond that brought about near disaster for both of them.